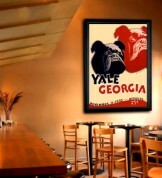 From the days Georgia first adopted the bulldog as their mascot, the Dawgs have been a force to reckon with. Relive some of the iconic moments in Georgia’s gridiron history through our vintage Georgia posters. Start with the 1929 dedication of Sanford Stadium and Georgia’s first bowl game, both smashing victories. And to see the true heart of the Dawg in vintage football posters, check out our classic Jack Davis program covers from the 1981 Tennessee and 1985 Florida games---you’ll duck for cover. Due to a series of changes in the makeup of conferences, HistoricFootballPosters.com has been required to remove many of the posters which we had previously offered for sale. The affected games have been moved to the bottom of the page, and designated "Not For Sale----For Historical Reference Only".